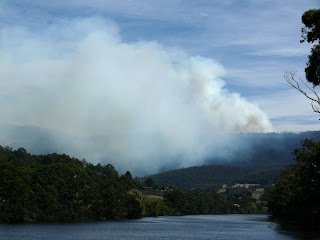 A significant blaze is threatening the Huon Valley. Here are some pictures of the view from Huonville. The helicopter has just been refuelled on the footy oval, as the smoke intensifies in the background. The shot up the river is just a few minutes after the first. I understand this fire is burning in difficult-to-access country off Judds Creek Rd. 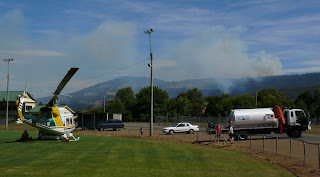 From Huonville, it's difficult to tell which of the two fires in the vicinity might be causing the concern right now. There's a moderate northerly blowing, and this won't help.